The Lamb Patties are a complete diet and provide all the convenience of a conventional dry food without compromising the nutritional value, bio-availability, and proven health benefits of real raw meat. Serve as is or rehydrate by adding water. 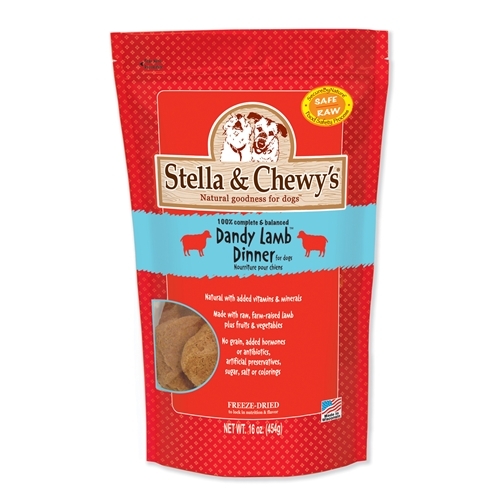 Stella & Chewy’s Freeze-Dried Lamb Patties are made from 95% human-grade,USDA Inspected RAW meats and bones, and 5% organic fruits and vegetables. The Lamb Patties are a complete diet and provide all the convenience of a conventional dry food without compromising the nutritional value, bio-availability, and proven health benefits of real raw meat. Serve as is or rehydrate by adding water. Great for travel, training rewards, and treats. Appropriate for all life stages feeding.